Mark Hamill has been pretty vocal about his opinions on the latest Star Wars trilogy. He recently revealed that he was a bit sour that Han Solo, Luke Skywalker, and Leia Organa were never reunited all together on the big screen. 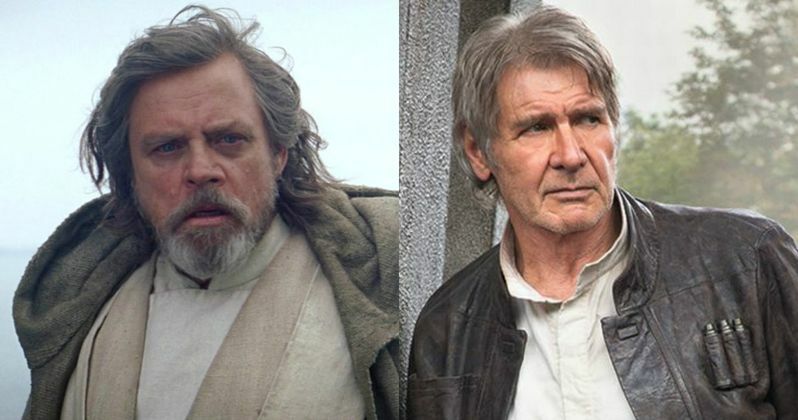 So, the actor decided to share what a reunion between Luke and Han would have looked like had it happened in The Force Awakens, The Last Jedi, or Star Wars 9. Mark Hamill shared a picture of himself and Harrison Ford from when the actor received his star on the Hollywood Walk of Fame last year. The two are embracing and it's a really cool photo for Star Wars fans to see. However, the duo will not be reuniting when Star Wars 9 it's the big screen unless it's through some flashbacks that have previously been filmed. Hamill captured the photo by saying, "What a Han/Luke reunion might have been like..."
The image of Mark Hamill and Harrison Ford hugging each other will more than likely bring up a strong reaction from Star Wars fans. In a recent interview promoting Knightfall Season 2, the actor seemed to have a pretty big problem with the way that The Last Jedi killed off Luke Skywalker. Hamill thought that the second movie in the latest trailer was just a good set up for Star Wars 9, but he did get the story that he wanted when all was said and done. That element of the story has been a major sticking point for some fans who believe that Rian Johnson ruined the Star Wars franchise. Rian Johnson almost kept a scene in The Last Jedi where Luke Skywalker is seen grieving his old friend Han Solo alone in his hut, but it was later cut out. That was another element that was criticized in the movie, though one can see that Luke clearly is grieving for his old friend, it just wasn't explicitly seen in the final cut. Johnson had this to say about his decision to cut the grieving hut scene. "We realized just for pacing in that section we had to stick with Rey and Luke, and we wanted just to go straight from him slamming the door of the hut into the day-in-the-life montage, of him going around the island. Taking that bit out suddenly propelled us forward into that segment in a way that just felt much better for the film." Rian Johnson stands by his decisions that he made in The Last Jedi and for the most part, a lot of Star Wars fans do to. However, there will always be a small amount of fans that will forever hate the movie and the director for "ruining their childhoods." While Hamill's comments may have been out of context in the interview, the post of the reunion image seems to point that he truly has some negative feelings towards the latest trilogy and the way it all worked out. You can see the reunion tease below, thanks to Mark Hamill's Twitter account.